There are several ways you can offer your feedback and review. You can use Facebook, Google+, Twitter or LinkedIn from this page. Below you will find instructions for each method. If you are a client or customer we appreciate your constructive feedback. Let us know if we were professional, let us know if we answered all your questions, let us know if the price was right. Tell us why we made you happy and if there is something we should improve, let us know that too. After 37 years of helping customers we want to do better for you and you can help. Thanks in advance for your feedback. Click on the Google+ icon above the mape and text and you will be presented an opportunity to leave feedback for Insurance Associates Agency Inc. and Terry A. McCarthy, CLU, ChFC. A similar icon is right of the Facebook icon below the map. 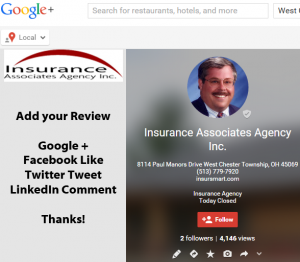 Click on the “g+1” in either location. Below the map and to the right of Facebook and Google+ icons, you will see the Twitter bird to “tweet” your comments to our Twitter page. Below the map and to the right of the Facebook and Google+ icons, and right of the Twitter icon, you can click on the “in Share” button to share your feedback our our page on LinkedIn. Thanks for your votes and thanks for the feedback. Use the icons below to provide your feedback and reviews.